Borneo is one of the most biodiverse places on Earth. lts unparalleled profusion of life is the result of millions of years spent in the tropics – longer than anywhere else. lts varied habitats, from the world’s oldest tropical rainforests to some of its largest cave systems, have fuelled the evolution of the most bizarre and enigmatic wildlife on our planet. This is a realm of giant apes, pygmy elephants and air-breathing fish, where over 15,000 different species of plant grow. Borneo, Earth’s ancient isle, is a place quite unlike any other. Borneo’s rainforests are the oldest on Earth – over 120 Million years in the making. The island sits at the end of the Asian continental shelf, so many of its inhabitants arrived here from Asia during past ice ages, when sea levels were lower. Animals simply walked across and, once isolated, evolved into new species. To adapt to life in the dense rainforest, Borneo’s bears and elephants became the world’s smallest. Borneo’s trees, however, are among the world’s tallest. One family of trees has dominated Borneo’s canopy for 40 million years – the dipterocarps. With some reaching almost ninety metres tall, they affect all life here. To live amongst these giants, Borneo’s forests have become home to more gliding vertebrates than anywhere else – from flying frogs to lizards and even snakes. 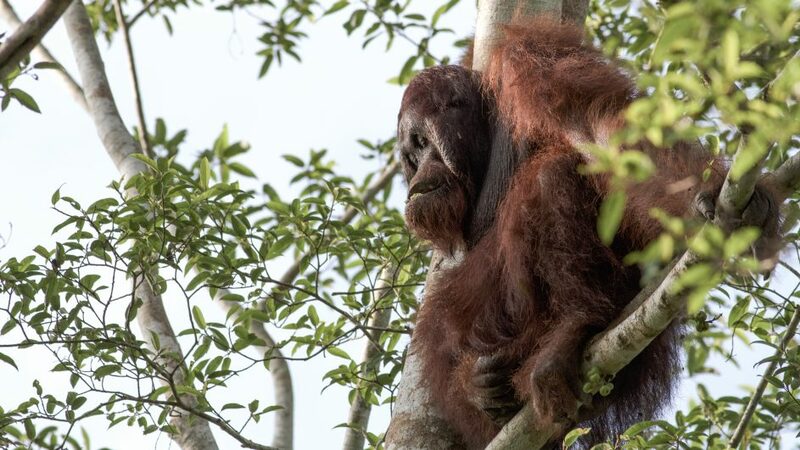 This treetop realm is also home to the world’s largest arboreal animal, the Bornean Orang-utan. Borneo’s dipterocarp rainforests are one of many unique habitats that have driven its extraordinary biodiversity. At the heart of the island, Mount Kinabalu rises to over 4,000 metres. It was pushed up from beneath the Earth’s crust some 50 million years ago. Today, the mountain is home to enormous red leeches which feed on giant earthworms, as well as an extraordinary diversity of carnivorous pitcher plants. Like Mount Kinabalu, much of the land which makes up Borneo was pushed up in the ancient past. Millions of years of tropical rainfall has carved out some of the largest cave systems on earth, with ceilings over 60 metres high. Recent discoveries show another reason behind the size of some of these caves – bat poo. Millions of bats inhabit the caves and, as their droppings are broken down by legions of cockroaches and other organisms, they turn acidic, eroding the rock. Combined with carbon dioxide from the bat’s breath, the caves are eroded away at a rate of one metre every 30,000 years. Borneo’s ancient habitats are extraordinarily complex, though none more so than its coast. Ruled by the tides, its mangroves are home to proboscis monkeys, fighting mudskippers and fishing owls. On one small offshore island, an ancient lake, lifted out of the sea, holds thousands of stingless jellyfish, which have evolved to harvest the sun’s energy to survive. Spectacular, beautiful and bizarre: this is the story of how Borneo became the most biodiverse island on earth.